Jaelene Hickle is a world-class professional soccer player with the North Carolina Courage. She is also a deeply committed Christian. When she declined to play for the US National Team because the US jersey celebrated "LGBTQ Pride," she did so because she felt she could not celebrate something that the Bible condemns---something that violates her beliefs and her conscience. She was booed by the fans when her team played in Portland last week. True Christian commitment has consequences. Jaelene Hinkle is a 25-year-old American soccer player who currently plays for the NWSL’s North Carolina Courage. Last June, the defender was named to the USWNT’s roster to play in a couple friendlies, but refused the call-up, citing “personal reasons.” In a recent interview, the devout Christian athlete explained that her decision was motivated by her desire not to wear the USWNT’s special LGBTQ Pride Month jersey. In the interview in question, which Hinkle gave to the 700 Club (of course), Hinkle went over her athletic experiences and talked about how her religious faith has affected them. Eventually, she got to her choice back in June of 2017 to snub the USWNT. The Oregonian newspaper says, "Jaelene Hinkle shocked the women's soccer community when she made the decision to decline a call-up from the US Women's National Team last June. The Oregonian notes that "Her decision came shortly after US Soccer announced that the squad would be wearing jerseys in honor of LGBTQ Pride Month during their June friendlies [games]. There was speculation at the time that Hinkle, who is a devout and outspoken Christian, was withdrawing from the team because she didn't want to wear a pride jersey." While it was apparently known last June by those close to her why she made the decision, it was only after she shared her decision recently on the 700 Club that she began to experience the wrath of the homosexual community. Deadspin says, "The 700 Club released the interview just yesterday, and it didn't take long for news of Hinkle's admission to spread. 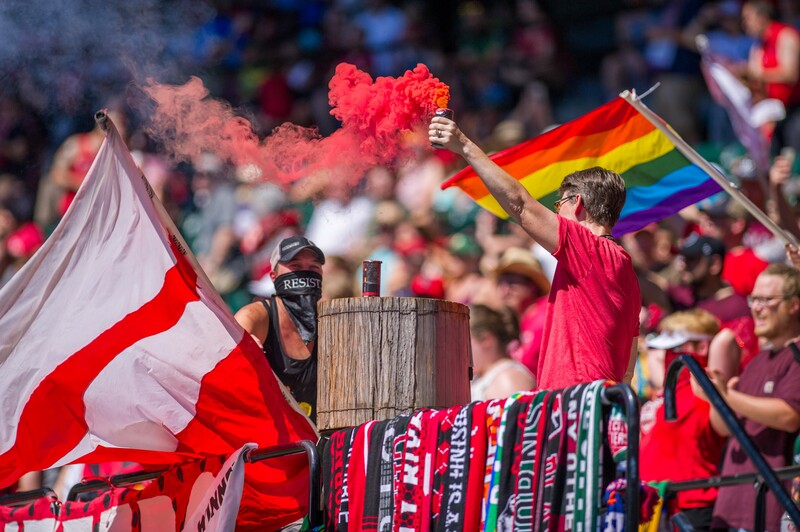 Last night the Courage played an away game against the Portland Thorns, and Portland's fans made sure to voice their displeasure with Hinkle." The Oregonian reports that Hinkle was booed by the Portland crowd "when her name was announced. One fan in attendance brought a banner that made mention of the incident." Her coach said it was tough on her--"It's not an easy thing for her. I give her a lot of credit to be perfectly honest with you. Whatever her beliefs are, whatever she believes in, that's her." Hinkle told the 700 Club that she wrestled with her Christian faith – to which she’d first committed at age 12 – and trying to fit in throughout her soccer career and college. But when she got a blood clot during her junior year at Texas Tech, she faced the possibility of never being able to play soccer again. “Everything just came crashing down,” she said, and she promised God that if she’d be allowed to play soccer again, it would be for Him. Hinkle said it was “very disappointing” to give up something she’d dreamt about her entire life, but maybe the whole purpose of her stint with the national team was to be a witness to other players. The “peace” that came from following her conscience “trumped the disappointment." “If I never get a national team call-up again...that just is part of His plan and that’s okay,” said Hinkle. “And maybe this was why [I was] meant to play soccer. Just to show other believers to be obedient." “Hinkle chose not to play. Fair enough,” he wrote. “To her credit, she has not engaged in Colin Kaepernick-level grandstanding or did the usual thing and filed a lawsuit. She only declined to participate." “Yet that’s an unforgivable crime for our so-called liberals,” Williamson explained. “That’s what’s really behind the demand for public funding of abortion, contraception, and the like: The strategy is to ensure that everybody is implicated, corporately." Paul wrote this: "Be not conformed to this world, but be transformed by the renewing of your mind." When Christians really believe like Christians, they act like Christians---even when the public scorns them. Be Faithful. Be Vigilant. Be Bold. Be Prayerful. There is a reason all the civilizations, more technologically advanced than the stone age, which have ever existed upon the face of the Earth, not a one has continued to exist after only one generation of abandoning their commitment to strict monogamy, because human passion is a fire and it burns down all the things which keep famine, pestilence and war away. I believe everything about this young lady is true spiritualism. You got to follow your heart your beliefs and your faith. You can't be a part-time believer turn it on when it works turn it off when you don't work. And that's what Hinkle was saying be true to yourself and follow the lord no matter how much it hurts because in the end we have a life of Eternity that far beats the Quality life on Earth. Amen. Would the women's soccer ever choose to wear jerseys celebrating Christianity? I can't comprehend why they would chose to celebrate gey pride in the first place. I get it that gays and gay supporters would practice such silliness, but what would drive a national association to wade into such filthy waters? Hooray for Hinkle and her convictions to follow God. Not only is Jaelene being obedient to the Father, but God will bless her abundantly beyond all she could ask or imagine (Eph. 3). It may be rough from the world right now, but her eyes are not on the world. PRAISE GOD! Jaelene Hickle set an example for us all! how many profession Christians are unwilling to speak up when they know they should, how many are so afraid of conflict they stand silent when Christ is cursed, when Christians are cursed and trashed, when immorality is pushed into their faces with glee...how many with far less to loose than Jaelene lack the courage (that's synonymous with faith) to act when they know they should. Jaelene pays a massive price for us to benefit. How do we respond? The manifestation of faith is action. The cowardly restraining of faith is silence in the face of evil.